A lifetime ago I taught kindergarten. I read once, as a teacher, that when a child hugs you, you should never be the first to let go....you let that child hug you as long as he or she needs to be hugged. I got that as a teacher. The kids in my class often came into school hungry, feeling the stress from home, and *needing* hugs. As a mom? You know what....sometimes I just need some personal space. I am in near-constant contact with these little loves All. Day. Long. I am often sometimes.... (okay...often....) the one saying "Okay, I love you, too! Now go grab that book you wanted to read!" or "Oops! Not so tight around the neck, 'kay!" or "Let go of Mommy's leg, please! I'm trying to walk!" or "Seriously. You need to let go. Now." 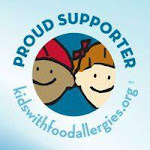 I read a great blog post today by a mom of not-so-little loves. 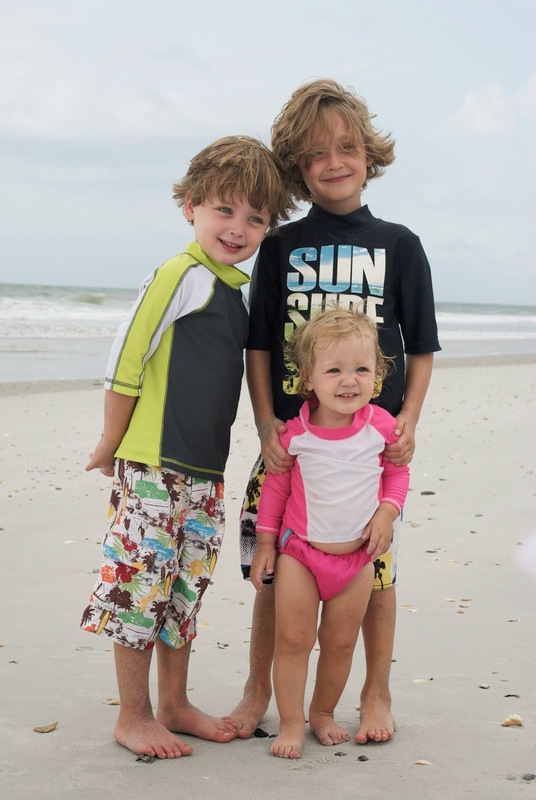 It's about how moms of older kids will often comment to harried moms of littles, "You're going to miss these times when the kids are older." The author disagrees: "You might not," she suggests, miss wiping noses, tying shoes, acting a pack-mule when going on such grand adventures as....The Grocery Store. I loved the post for its honesty. I loved it because it's how I think I'll feel as my kids get older (I hope so, anyway). And I loved it because it reminded me that some of these things...these parts of my daily life that I take for granted or don't even notice or get annoyed by....will go away. And whether I miss these days or not....they'll be in my memory. Even right at this moment, when I'm In It....they're Almost Gone. He's got one toe in the deep end of Being a Big Kid. He smiles, but wipes off my kisses. He smiles, but rolls his eyes, when I give him his "I love you more" bedtime send-off. And, as much as I might be completely hugged-out by the other two Hug Me kids around here....I'm missing his hugs. Today, Evan and Max were playing chase. Evan somehow snagged his hand on a drawer handle and bent his fingers back (because, you know....that happens?). He was upset and I held out my arms to comfort him. Some days, he might bend his head in towards me for a quick squeeze, then be off on his way. Not today. Today, he curled up on my lap. He sank into my chest. He put his chin on my shoulder and I Hugged Him. Tight. And I tickled his back and squeezed his not-badly-hurt fingers. And I savored the moment. Because....that toe in the deep end? Before I know it, he'll have cannonballed right in. Someday I'm going to look at him as he's sleeping and think....When was the last time I held him? Today wasn't the last time. Ironically, we ended the Seven-Minute Hug by reading his new library book.....Those hugs? Almost Gone. But not quite. P.S. It's a great book. We LOVE Steve Jenkins. He's our new favorite author/illustrator. And Evan, our resident Animal Expert, approves. Go check it out. 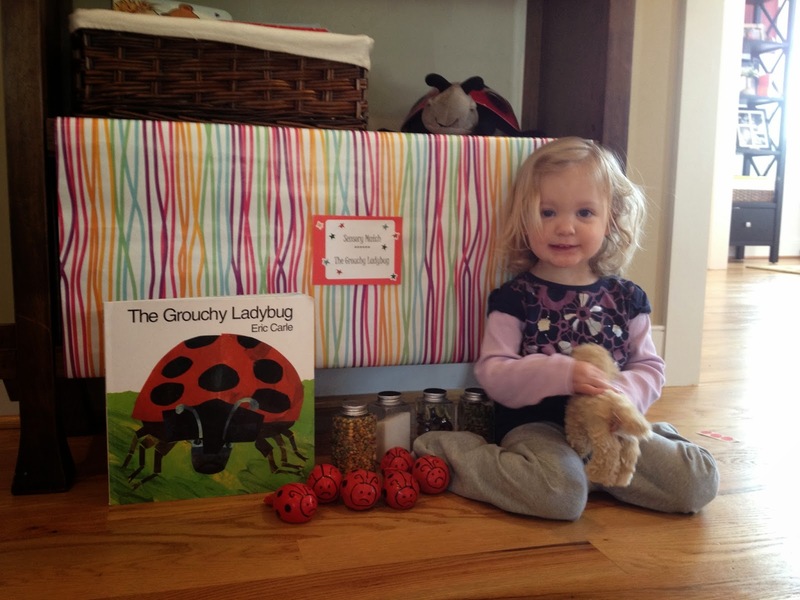 An Eric Carle Birthday Party: MOLLY IS TWO! And she's obsessed with the animals of Eric Carle. 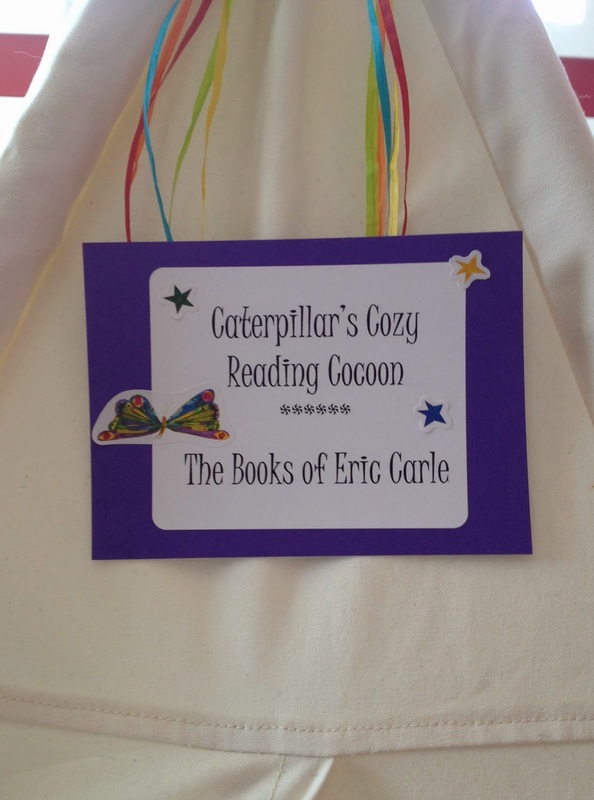 And so, an Eric Carle Birthday Party it was! We started, of course, with a cozy, little reading nook. It was set up days before the party, and will remain set up for awhile. 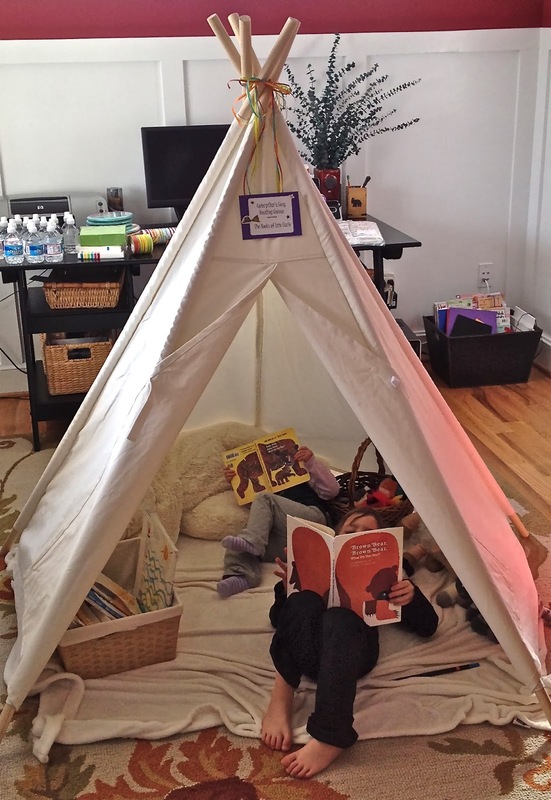 These sweet babes just love cozy reading nooks. 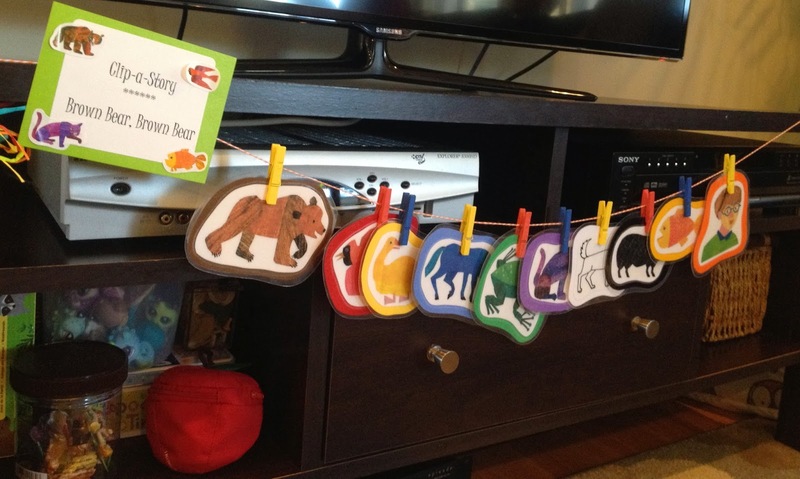 I printed out the animals from Brown Bear, Brown Bear, mounted them on construction paper, and laminated them. I strung up a line with mini clothespins and made a Clip-A-Story retelling activity. 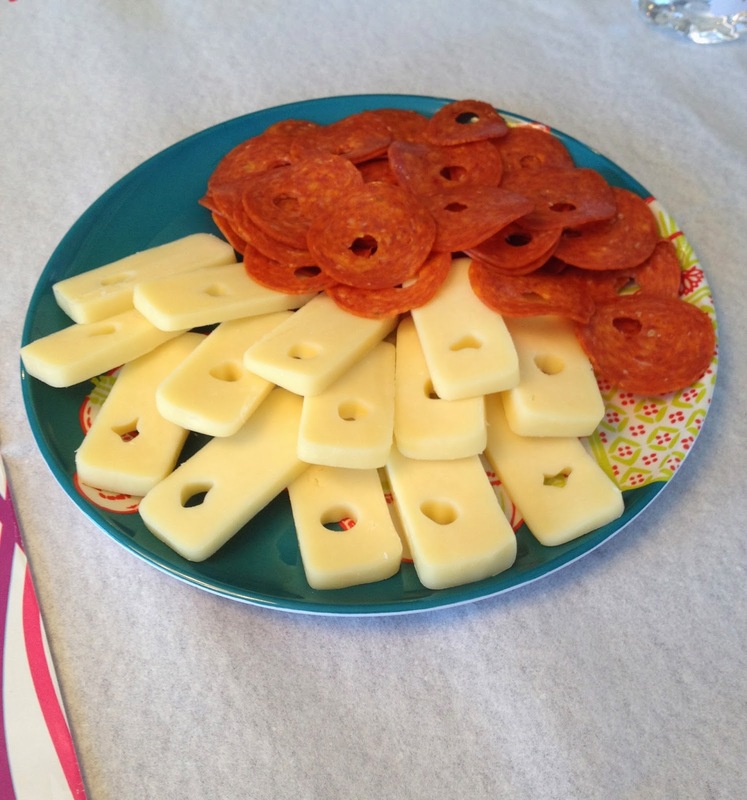 but it was perfect for the preschoolers. Max and his BFF dove right in. She kept photo-bombing, so I let her pose. 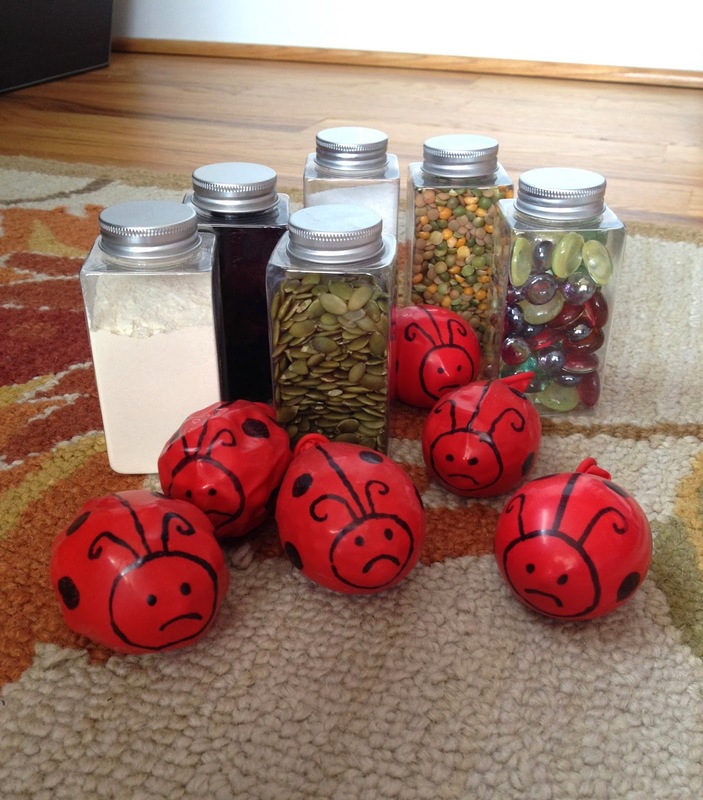 I made these Grouchy Ladybugs sensory bags by filling six balloons with six different materials (flour, pompoms, pepitas, course salt, lentils, and glass beads) for the kids to feel, but not see. I then put the same materials in clear jars for the kids to see and shake, but not feel. Could they make a match? The little ones just liked squeezing the balloons and feeling the different textures. They also discovered that some of the balloons bounced, some rolled, and some just landed with a thud. The big kids (and grown-ups!) tried to guess the matches. The Artist Who Painted a Blue Horse provided the inspiration at our art station. 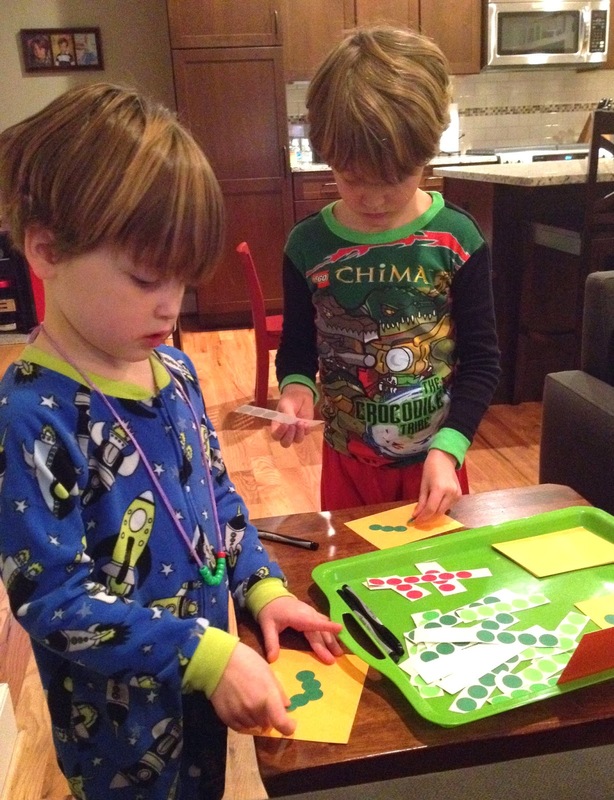 Although I never got a "final product" photo, we had a Very Hungry Caterpillar necklace-making station. 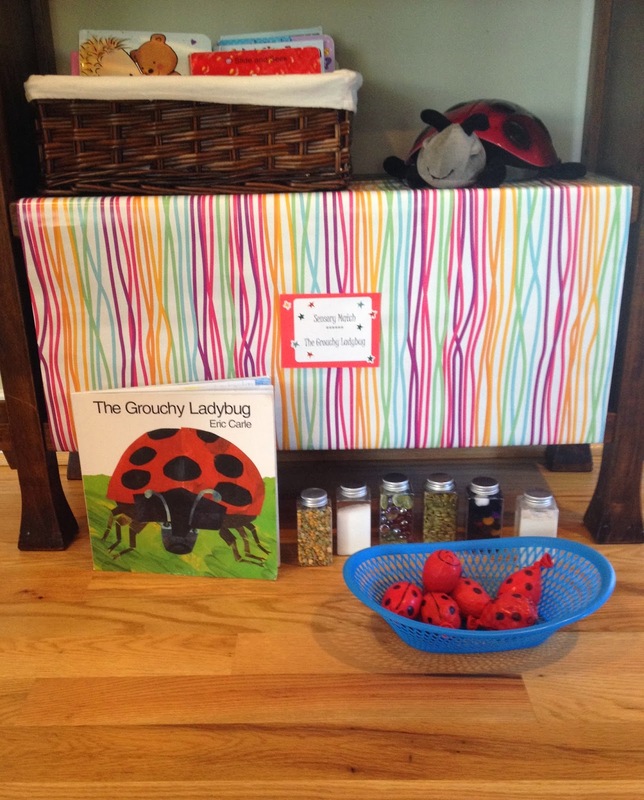 The goal was to string one red bead and eight or nine green beads to look like Eric Carle's most famous illustration. Molly was such a good helper for Pop. 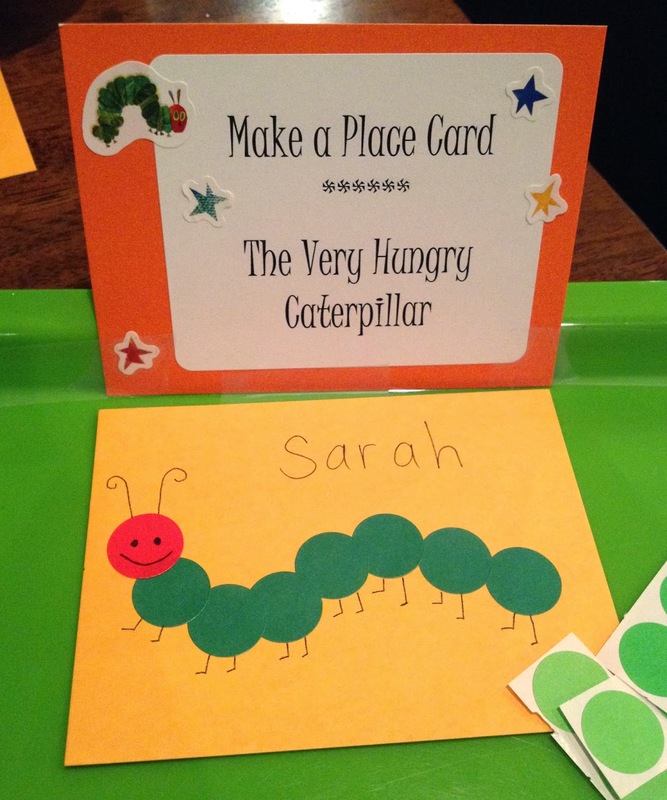 Very Hungry Caterpillar place card. Evan and Max got right to work making theirs early on the morning of the party. Evan wanted to make sure he was able to sit next to the Birthday Girl, Max wanted to make sure he got the seat with the "right" water bottle. It was a morning party, so we had cupcakes and a few snacks, not a real meal. 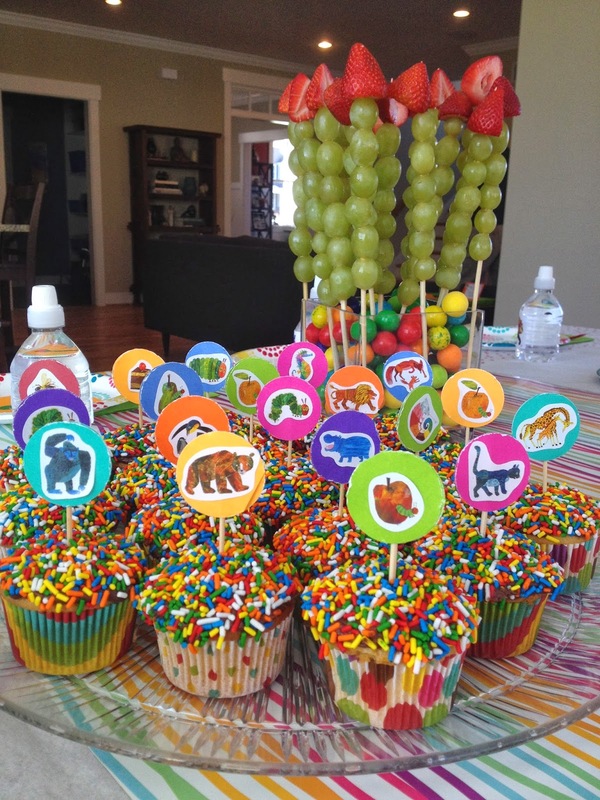 I made the cupcake toppers by cutting circles of colored cardstock, hot-gluing circles on either side of a toothpick. Max and Molly stuck Eric Carle stickers on both sides. Although she was shy when we first started singing, this girl lit right up by the end of her song. 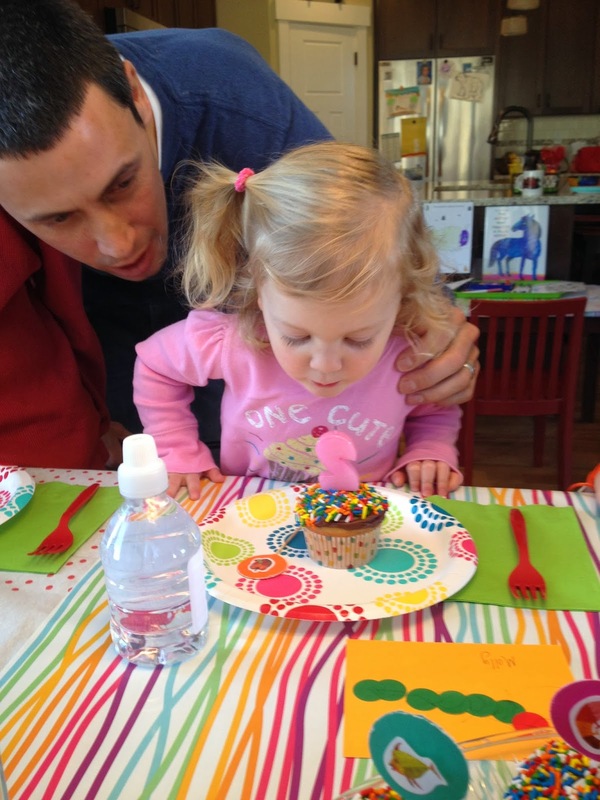 We had such a fun time at our sweet girl's second birthday. 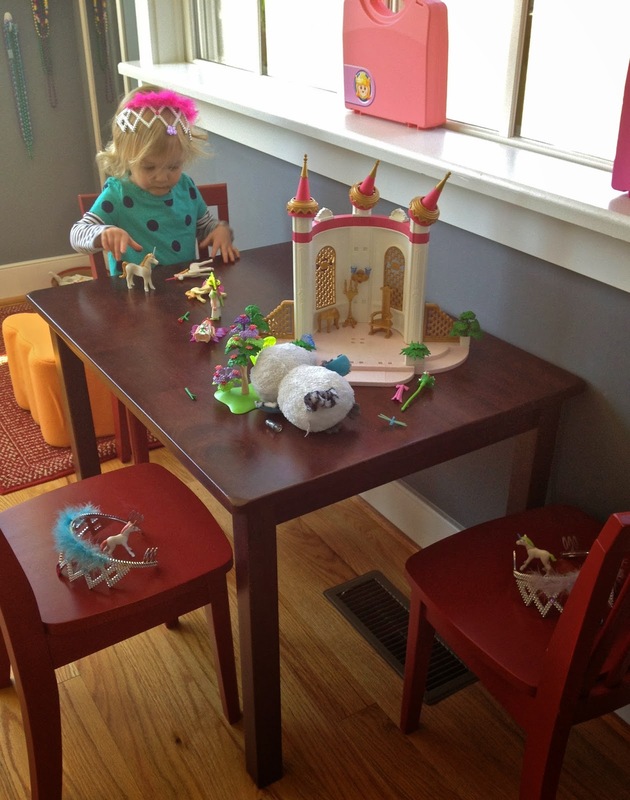 Like all birthday parties in this house, this one was fun and festive, and pretty simple...but....well, it seems I don't know how to do a just-some-cupcakes-and-playtime party. I can't help but find a theme my kids love and run with it. The fact that I only get to plan three birthday parties a year sort of kills me....so who needs a party planner? I'm actually kind of serious. Over the last year, as we have supported and encouraged our princess-loving, dress-wearing boy to Be Who You Are and Wear What You Like, I've had a number of people respond with comments such as "It's so good of you to support your son...no matter what," or "I'm so glad that Max has parents like you who allow him to be who he truly is." As if we're doing something brave by allowing Max to choose his own interests. I appreciate the support from my friends, relatives, and acquaintances....but I assure you....this is not a Mommy Be Brave moment. This is actually pretty easy. There are moms who are having to be very Brave right now. Did you know that there are Moms who let their children race down an icy track on only a small sled at over 80 mph, FACE FIRST? Of course you did. You've watched skeleton at the Olympics. The moms who say, "Sure, honey. I'll drive you to skeleton practice," are brave. Brave are the Moms who allow their child to be THROWN, spiraling through the air, OVER ICE, by another person who is wearing ICE SKATES. Brave are the Moms who watch their children fly off of ski jumps. And don't even get me started on slope style. Yeesh. Brave are the Moms who allow their children to endure matches that can last up to SEVEN HOURS of sliding heavy polished rocks, sweeping the ice, wearing funny, mismatched slippy-grippy shoes, and...okay, never mind. Brave are the Moms who watched and supported their children as they pursued a lifelong dream....and who were there to comfort their babies when their dreams were crushed by four HUNDREDTHS of a second. Motherhood requires emotional strength and, yes...Bravery. I'm just glad my kid is raiding the dress-up bin, not risking life and limb, in search of his shiny gold. I totally watched the Olympics with mommy goggles on this time around. It was exhausting. Baby Girl, you're a lucky one. And they [just about] always want you there, too. 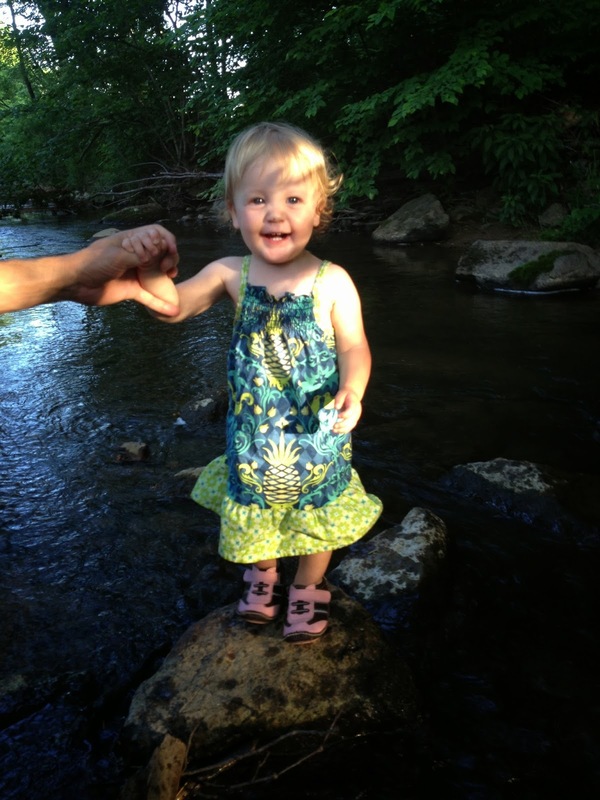 You are so loved, sweet Molly. So loved that you are smothered in hugs and kisses every morning when you wake up. So loved that you are included in just about every game and even given first choice of guy or pony or princess or costume. So loved that you have a cheering section at-the-ready for those times that you put on your own hat or take off your own shoes or climb down the stairs by yourself. Actually, the cheering section might not always be standing by...you kind of demand the attention when you announce your accomplishments with two fists in the air and a mighty "I did it!" You've always been Very Good at expressing yourself. Guess who wants to go outside? 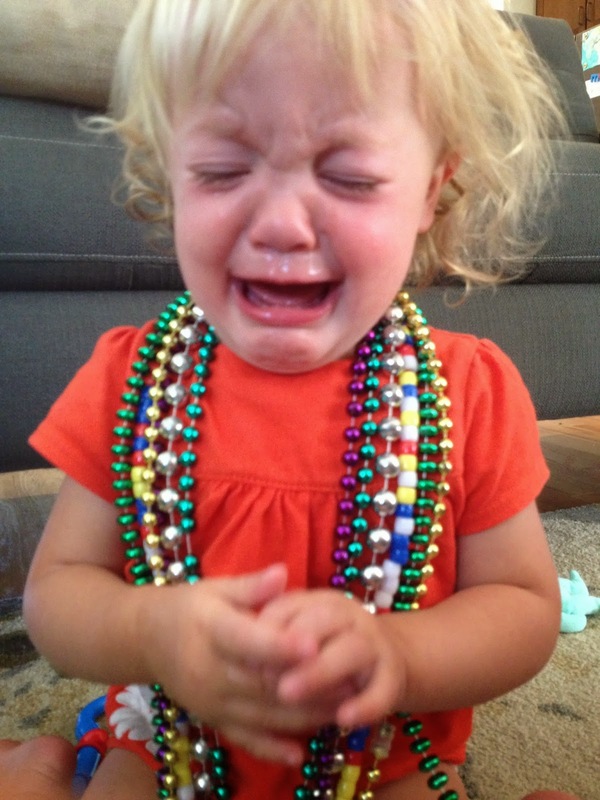 Guess who doesn't want to share the necklaces? Guess who is Not Pleased by tonight's menu? But now, baby girl, you're TALKING. It's one of my favorite things about You at Two. You repeat back anything we say to you (even when Max says things like, "Molly, say Bum Bum Bum Bum Pee!" or Evan says, "Molly, can you say General Grievous?"). You sing songs (complete with choreography!). 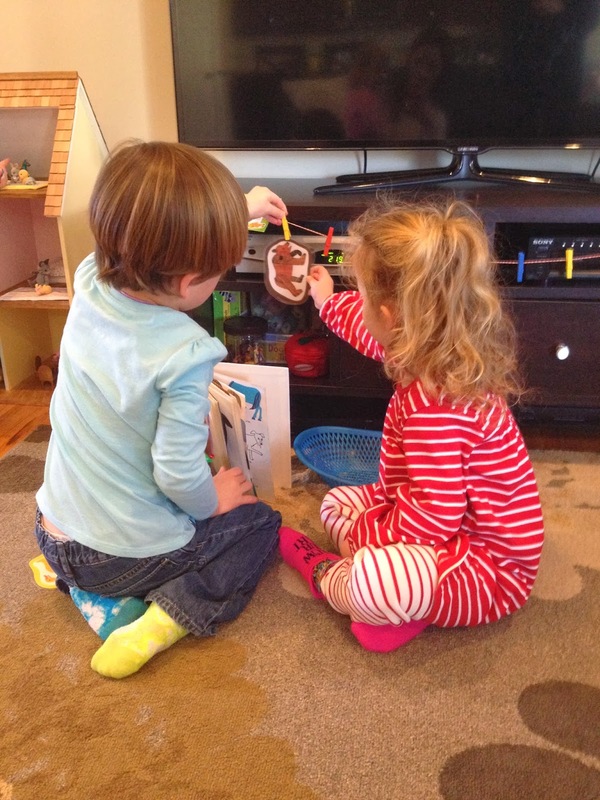 You re-tell stories (especially Pete the Cat, but others, too. Listening to you "read" Brown Bear, Brown Bear is another one of my favorite things, and the inspiration behind your Eric Carle-themed birthday party). And now you are stringing words together to make new, unique, and completely Molly sentences. 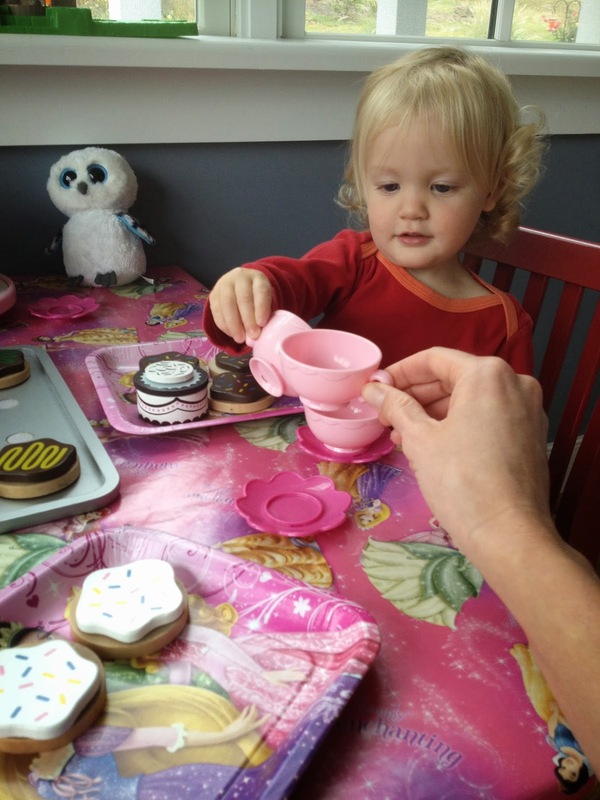 Is there anything more amazing than watching your child discover the power of language? You two take play Very Seriously. And you do a very nice job of dressing for the occasion. You always have. 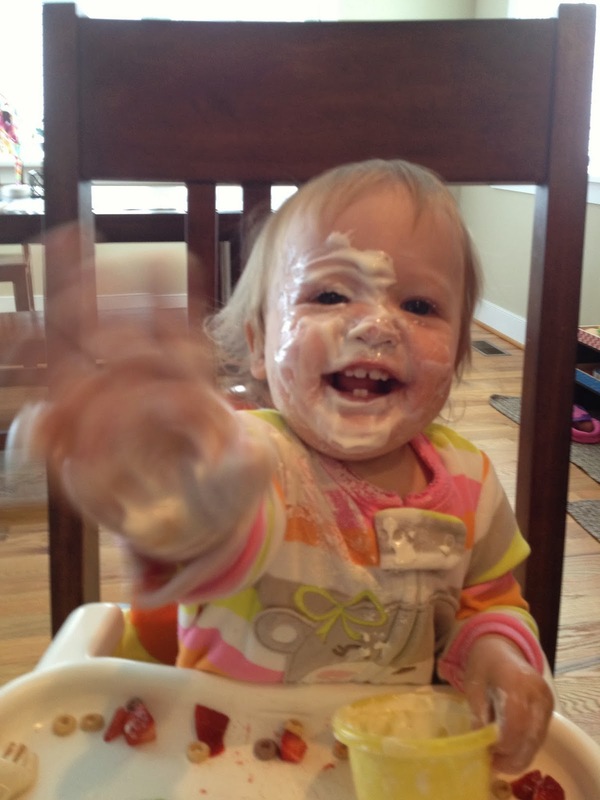 ....you dive right in when it comes to messy, sensory play and art. Baby girl, seeing you love your books is another one of the best parts about You at Two. ....or simply becoming one with your favorite book pile. This. This is why your party will be Everything Eric Carle. Your absolute favorite. In fact, when we tuck you in at night, we leave you with a pile of books in your crib. You use them as a pillow, then read them to your buddies in the morning. 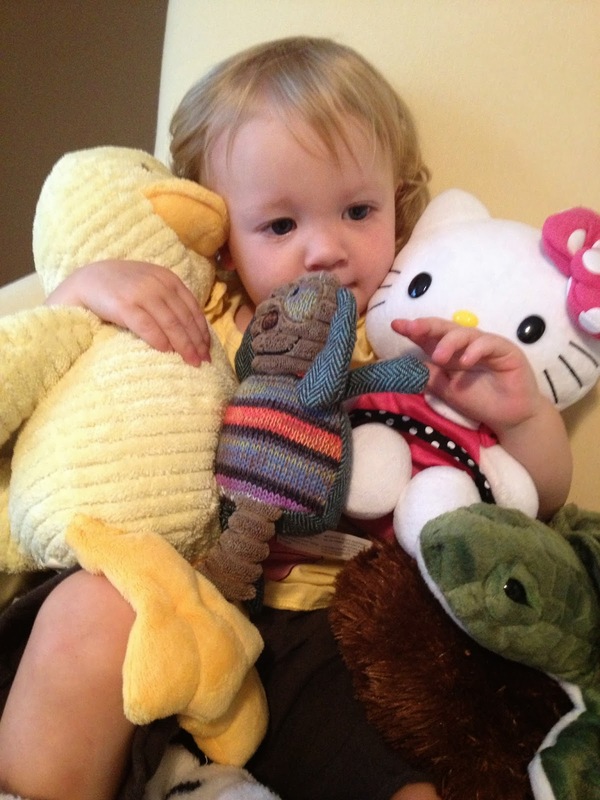 You have half a dozen baby dolls that you couldn't care less about...but those buddies? ....and all of those curls. Wasn't it just last week that I swaddled you tightly and laid you on the couch beside me, while I savored your too-little-for-a-proper-bedtime-ness? And now, you are the Big Girl. Holding, so proudly, so gently, the New Baby cousin. "My tur'! My tur' hol' bay Kee!" I love you so, my Molly girl. And I'll say it a hundred times a day so I can hear you respond in your perfectly tiny, perfectly lovely little voice: "I do, too." And my heart, a hundred times a day, will melt. Happy, happy Birthday, my sweet Dragon Lady. Little ones, I want to see you be Brave.